If you're a woman traveling to Kenya, personal safety is probably the number one concern you have. But for women traveling to Kenya on their own, if they follow some basic precautions, they should be OK. Thousands of women travel alone in Kenya each year and have a great time. Of course basic health and safety precautions should be followed by all travelers to Africa but here we concentrate on issues particular to women visiting Kenya. Women traveling alone in Kenya will likely experience some unsolicited attention from men but it's usually more annoying than dangerous. The basic problem lies in the fact that local women will rarely travel alone, it's just not culturally acceptable, but situation is changing. So along with Hollywood movies and scantily clad western female tourists on the beaches, the idea that western women are "available" is quite pervasive. This is though not a cause for alarm. * Ignore cat calls, tsskkss's, whistles and anything else thrown at you verbally by bored men. * Wear sunglasses to avoid direct eye contact with men. * Respect the culture you are in. * Dress conservatively. This is very important in Muslim regions like Mombasa, Malindi and Lamu if you want to avoid extra attention. No mini skirts, shorts, tank tops or tight shirts. * If you feel you are being harassed or followed, walk into a shop or hotel and ask for help. * If you are lost ask directions from a woman or family. * Make a scene if you are groped or pinched and shame the person publicly. A shout will usually do the trick. * Stay in a hotel where you can lock your door at night. Family hotels are often the most comfortable for women traveling on their own. * Bring your own feminine hygiene products with you. Sanitary towels are available and most major towns will have supplies but you probably won't have a lot of choice and they'll be very expensive. * Other medical supplies you should pack include a couple of treatments for UTI's and yeast infections. If you are on the pill, bring enough to last your whole trip. Remember that a bout of diarrhea or vomiting will render the pill ineffective, so be careful. If you find yourself in a situation where you aren't comfortable traveling on your own then it's quite easy to find yourself some travel companions. You'll be able to meet local women a lot easier that way. 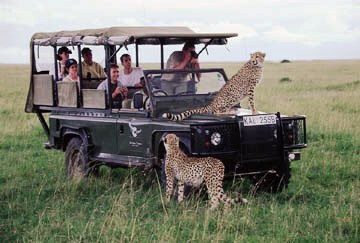 * Post your itinerary on masimba safaris tips for women travelers. As this is a good site where you could find a travel companion. * Join local tours when you first arrive so you can get your bearings and acclimatize to the culture. Finally, I find travel blogs by people who are actually traveling or living in Kenya to be a very useful source of information on current conditions. There are lots of women writing blogs from all over Africa who are either volunteering or traveling there right now and would have excellent advice for you. * Carry short shorts and skirts for use at the coast; go for clothes that will cover the knees and shoulders to respect local cultures in the mainland. * Jeans and t-shirts is highly recommended, as this is what locals wear in many areas. * Kenya’s parks are very dusty and the red soil will instantly dirty light colored clothes. * Make sure you have a light scarf – it's a really easy way to cover shoulders or hair where appropriate (such as visiting a mosque). There's no need to buy one before you go – you can easily buy a very cheap scarf or sarong once in Kenya. * Pack some warm layers; don’t assume that Kenya will be constantly hot! Evenings can get pretty cold, particularly in the cold season of June/July. * Avoid jewelry as it makes you a target for mugger’s pickpockets and there won't be much opportunity to wear it. * Take plenty of toiletries and cosmetic supplies if your trip will include long periods of time outside of major cities. It can be both expensive and difficult hard to find everything from shampoo to mascara once you get off the beaten track. * The same applies to contraceptives (especially oral), so take a full supply. * If you need to wear lenses, contacts can cause irritation in dusty or sandy areas, so take a pair of glasses just in case and some eye drops to ease discomfort. * To avoid taking bulky bottles for a long trip (you won't thank yourself for packing a heavy bag in the African heat! ), try Lush shampoo bars, which can also double up as soap. * Take a small scrubbing brush – great for getting out ingrained dirt after long periods in dusty countries, which can make you feel instantly cleaner and better! * Other great supplies for girls include Echinacea, vitamin C and lavender oil – these can be a great pick-me-up but are hard to find locally outside major towns. * Iron supplements and dried fruit (e.g. apricots) are helpful during menstruation - excellent for those extra munchies and your body's special needs. For a woman wishing to travel to Africa, Kenya is the perfect choice and if these simple tips are followed then the safari will be a guaranteed satisfaction. Join in and write your own page! It's easy to do. How? Simply click here to return to Travel Tips.